A heartfelt video has gone viral and has set the bar for police officers across America as it shows what compassion and discretion are capable of creating. 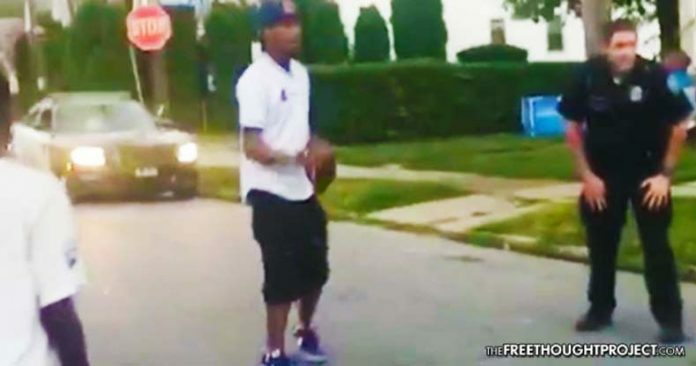 Buffalo, NY — In the land of the free, playing football in your neighborhood street can be a criminal act which can often be met with police force. Kids in a Buffalo neighborhood were about to experience what playing football looks like in a police state — that is, until Officer Patrick McDonald showed up to the call. Time and again, we’ve seen children held at gunpoint for walking home from a basketball game or assaulted for riding a bike. However, this story is different and it shows what a positive effect a compassionate officer can have when he uses his officer’s discretion while policing. “I joined them for a couple of downs, and as you can see it’s taken on a life of its own,” McDonald said about the video which has since gone viral after being posted on social media this week. “I’d just like to think that any other officer would have done the same thing that I did, and I bet there’s others who probably have,” he added. The next video shows the officer running and catching a Hail Mary pass. In the final video, he jokes with one of the children that he should write up a police report because he just got robbed. Even after the officer was done playing with the kids, he engaged in humor as he pulled off in his cruiser. What could have been a terrible situation involving the arrest and assault of juveniles ended instead with a community coming together. When police officers choose to use discretion instead of the escalation of force, everybody wins. Officer McDonald has set the bar for other officers who may or may not be so likely to oblige. This is what community policing looks like. When reporting on this incident, the Free Thought Project would be remiss if we didn’t show you a story of the opposite of McDonald’s behavior. As the Free Thought Project previously reported, the Cleveland Police Department actually confiscated a basketball goal and ticketed the owner for having it. According to Toledo News Now, as a kind gesture, a woman, Cheri Fiorilli, had bought the goal for her neighbors for helping her out. But in Cleveland, it happens to be illegal to play basketball in the street. Instead of merely talking to the kids and engaging in conversation — or a game, like McDonald did — these cops just did their jobs, and ruined all trust in the community in a single move. She offered to move it immediately, and was told there’s no leeway. Fiorilli and the kids were left stunned as the cop threatened to arrest the woman over her basketball goal. “I need to see your driver’s license again. If not, I have to arrest you for refusing to comply,” said the officer. Instead of a community coming together and laughing as the officer drove away with a newfound trust in police, these citizens were left with a citation and the view of cops driving down the street with a basketball goal in their trunk. Below is a video of how not to police.